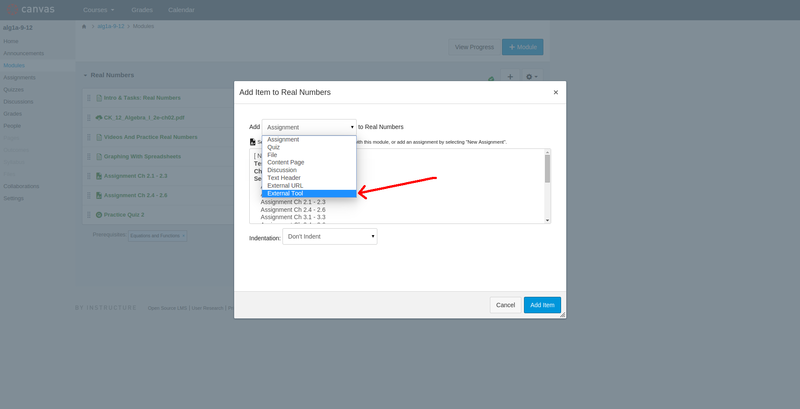 If you use Moodle, Brightspace, or Canvas, or any other similar online gradebook system, you can now embed School Yourself"s lessons into your course. Sign up with School Yourself to obtain your consumer key and secret. The Learning Tools Interoperability (LTI) standard is a convention that content providers such as School Yourself follow in order to work together with Learning Management Systems (LMS), like Moodle, Brightspace, and Canvas. 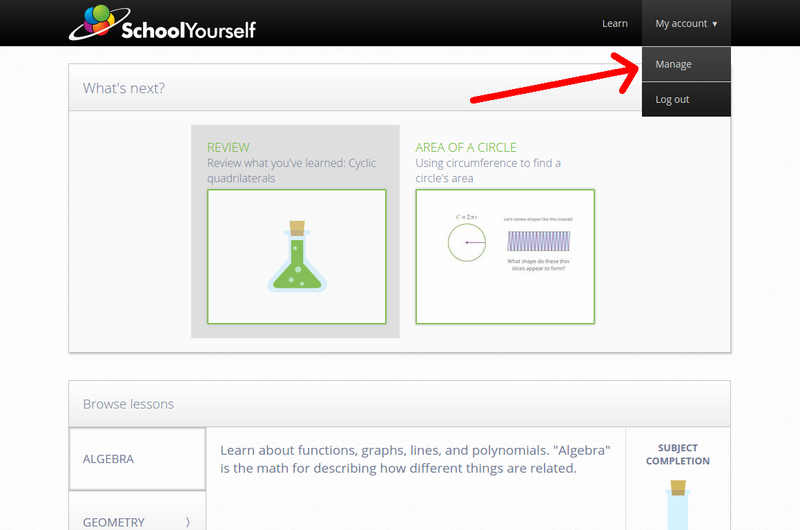 This lets you assign School Yourself lessons and reviews to your students and keep track of their progress. To use School Yourself lessons and reviews in your LMS, you will need three pieces of information: a launch URL, a consumer key, a consumer secret. These instructions will show you where to find them, and where to enter them in your LMS. 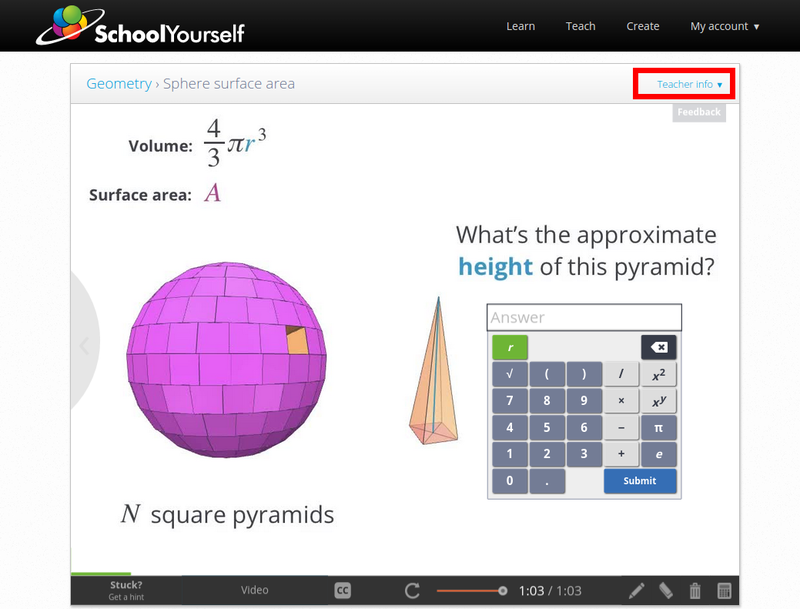 Navigate to the module or review that you wish to embed. Click on Teacher info to expand the tab. You can copy this launch URL into your learning management system to embed this module or review. 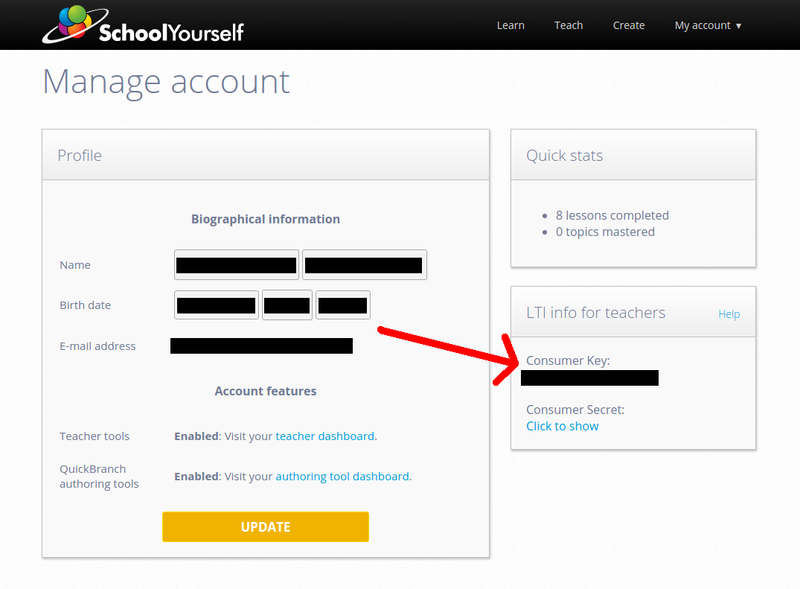 Once you sign up for a School Yourself account, navigate to the account management page. Your consumer key and secret will be available from this page. Click the link to show your consumer secret. Navigate to the course where the external tool should be embedded and click Turn editing on. Note that this can only be done as a teacher or site admin. 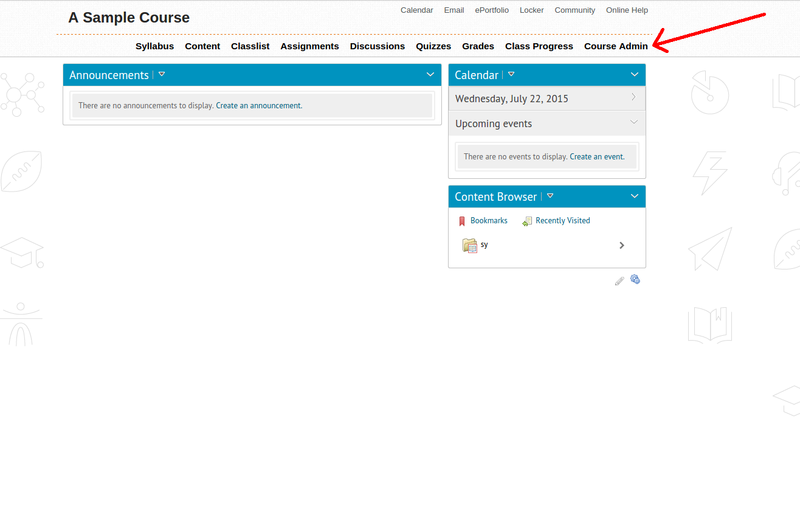 You will now have the option to Add an activity or resource underneath the course topics. Select External Tool from the menu that pops up and click Add. Under the General section, click on Show more to expand the section. Fill in the desired content URL (Launch URL) as well as your given consumer key and secret. You can save and view the external tool once you have completed all other appropriate fields. If you wish to accept grades from the external tool, you can specify this under the Privacy tab if your site administrator allows it. 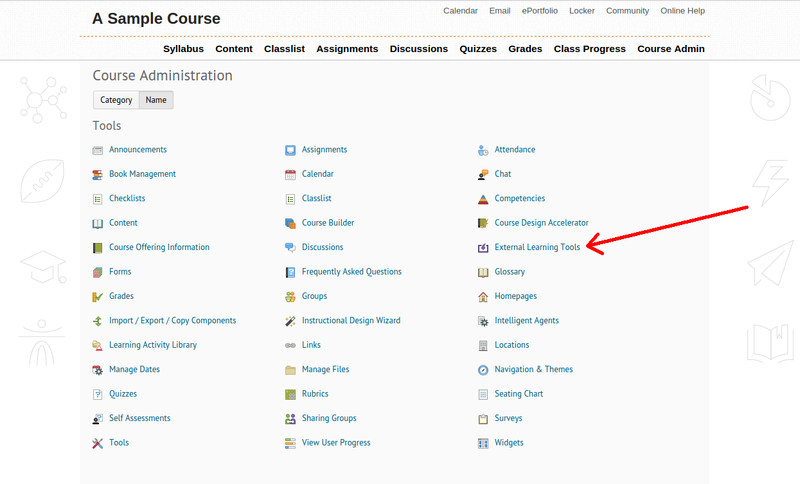 Navigate to the course where the external tool should be embedded and select Course Admin. 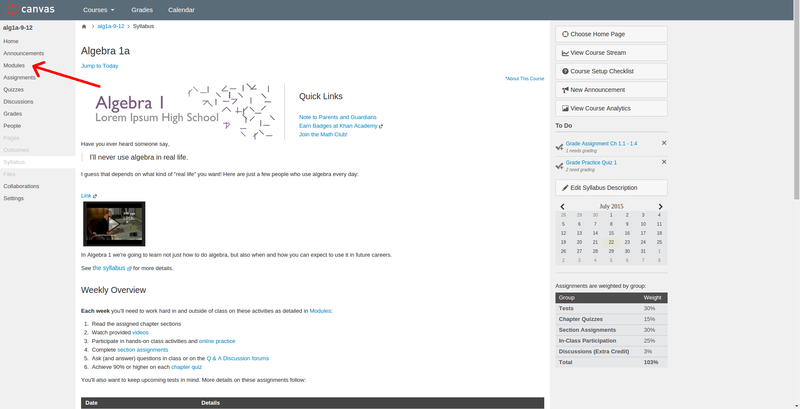 Select External Learning Tools from the menu. Under Key/Secret, tick the box that says Link key/secret and fill out the desired launch URL as well as your given consumer key and secret. 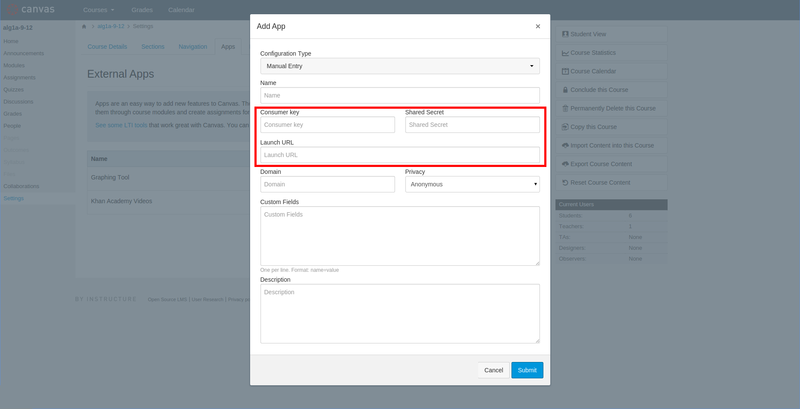 Fill out any other necessary fields, then save and close the form. 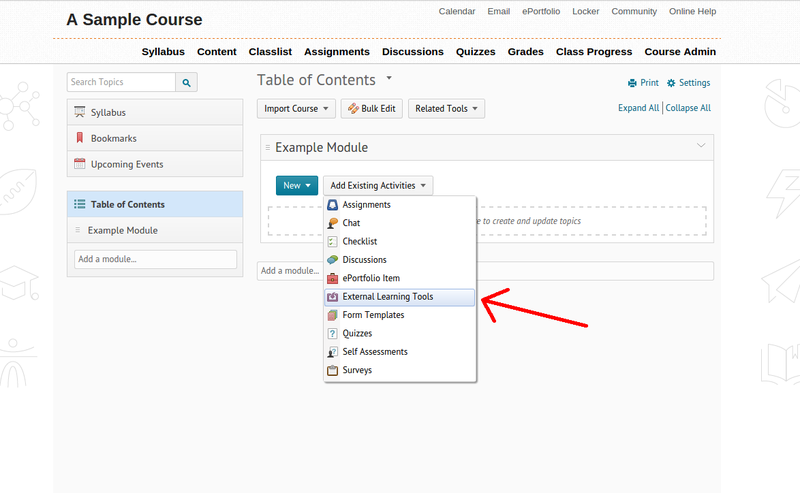 You can now add the external tool under any module in your course content. 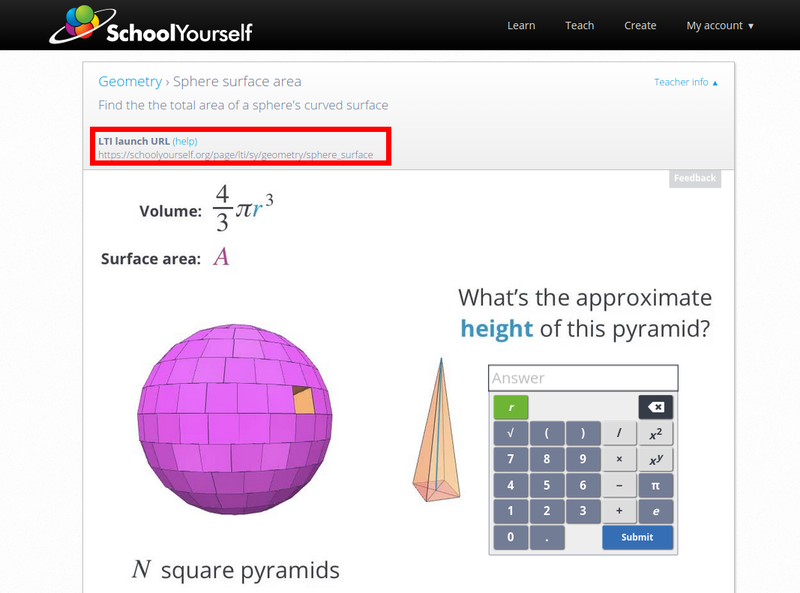 Navigate to the course where the external tool should be added and select Settings from the tab on the left. Select the Apps tab on top and click the Add App button. 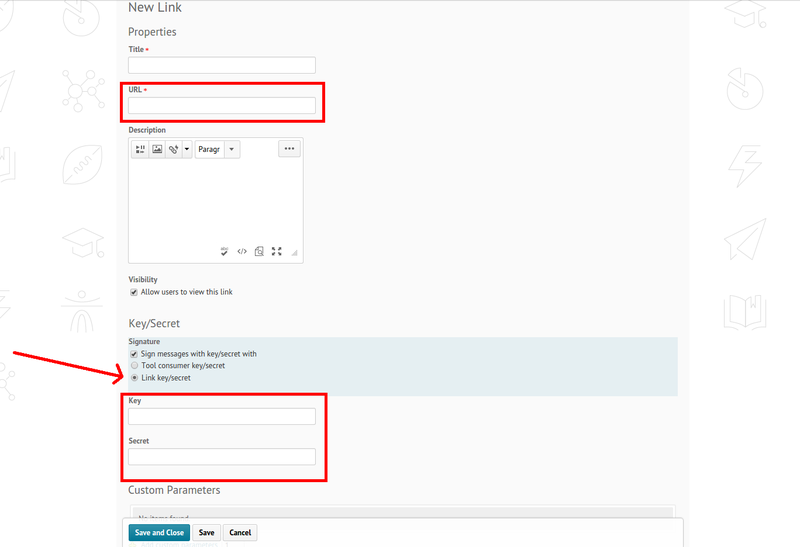 Fill in the desired content URL (Launch URL) as well as your given consumer key and secret. Fill out all other appropriate fields and click Submit when you are finished. 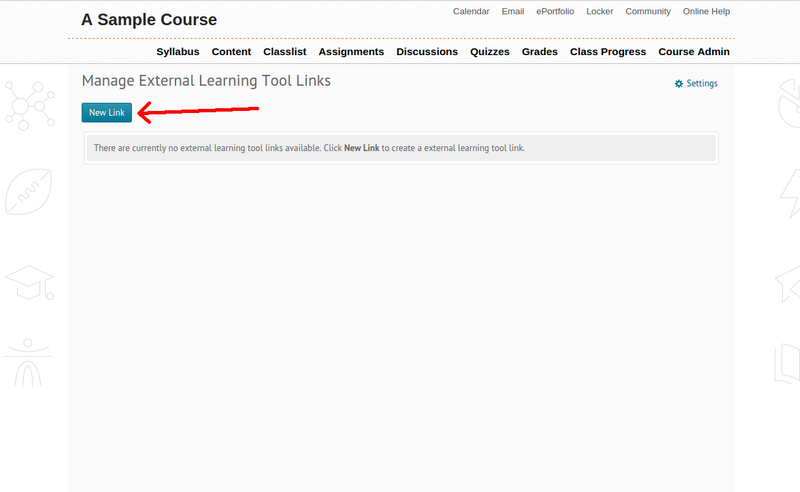 To add this external tool to a course, navigate back to the course homepage and select Modules from the tab on the left. 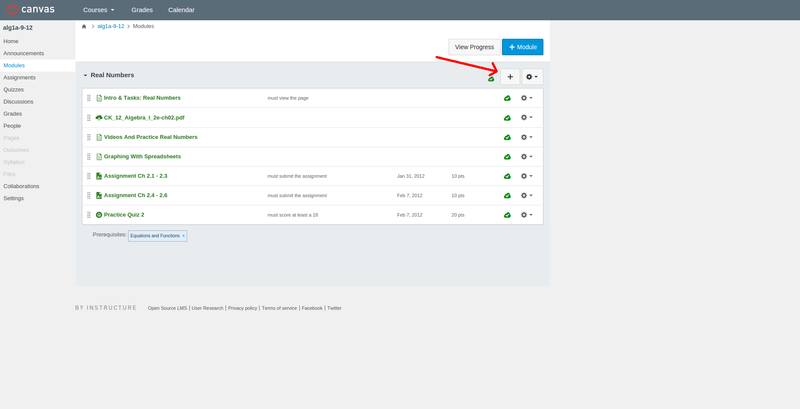 Click the + button next to the title of the module that you would like to add the external tool to. Select External Tool from the menu that shows up. You should be able to see the external tool that you added before from the Settings menu. Simply click on it and the rest of the information should be filled automatically. Click Add Item when you are finished. Any LMS that supports LTI can embed our content. This option is usually located in the course, module, or administrative settings. As with the LMSes shown above, you will need to provide a launch URL, consumer key, and consumer secret.